How can you expect your franchisor to support you when you're opening your own franchise location? While it depends on the franchise, for Peter Castorena, franchisor support came in the form of everything from hiring tips to reminders to buy more soap. The Minuteman Press franchisee was drawn to the company because he wanted a franchise that knew its business inside and out. Here's what he has learned himself in the last nine years. 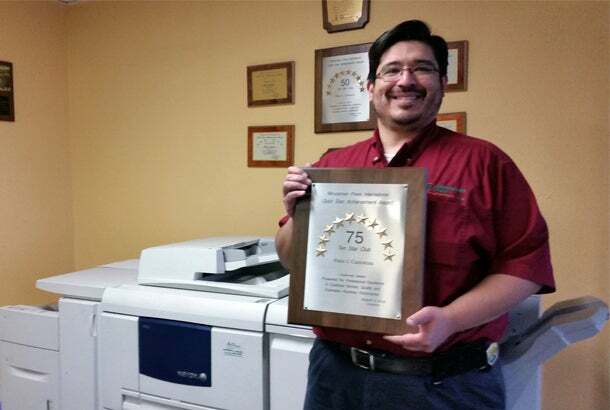 Franchise owned: Minuteman Press in Lancaster, California. I’ve owned my Minuteman Press Franchise since August of 2006. I chose franchising because I didn’t want to reinvent the wheel. I wanted to find a franchisor that excelled in their industry, one with a model I could execute. In my research prior to running my own business, I found that many businesses failed due to lack of planning or overinvestment of capital. The cost of a mistake is something I didn’t want to have to factor in – a good franchise should know the ins and outs of their business; it was that experience and help in planning I was looking for. I worked for a national retailer (Robinsons May|Meier&Frank) which was in the process of being absorbed into Macy’s. I worked in their corporate office as a buyer. It was very similar to running your own business – I had to purchase goods in a specific category, work with vendors to sell them, and manage the inventory levels. The major difference was I was using someone else’s billion dollar checkbook and I had a multitude of departments to lean on for support (i.e. marketing, HR, IT, MIS). I spent months during the course of my due diligence researching franchisors and working on a few business plans. There were two franchises I had considered moving forward with. Minuteman Press was one of them for a number of reasons. On first glance, they’re leaders in their industry with multiple locations internationally. They’ve got a proven track record of growth. Working with my regional vice president Dan Byers, I came to find that Minuteman Press was open and honest about how a franchise operated, especially since they encouraged me to visit and speak with existing franchise owners. All of the Minuteman Press business owners I spoke with (in various stages of their business from new, established, and “seasoned”) were open and honest and had not regretted getting into the Minuteman Press Franchise. Couple their experience, happy franchisees, and the amount of support I get on the local and international level from the home office and it was a classic square peg into a square hole scenario – the perfect fit. Well I’m a big fan of using as much of someone else’s money as possible. I did the legwork to get a small business loan so I wouldn’t have to bear the brunt of the expense on my own. At the end of the day I’d say I spent about $85,000 by the time I walked into my store on day 1. Just under $40,000 went to Minuteman Press International to cover their fees, another $40,000 went to the existing owner whose location I had purchased, and the balance went to modernizing the location with updated infrastructure for computers and networking. Initially, I leaned heavily on a franchise broker. After an extensive interview process they matched me up with Franchisors who fit the criteria of what I was looking for. Minuteman Press did not participate in this broker’s pool of franchisors – but using this service was invaluable in learning what questions to ask and who to speak to. Working in tandem with the broker I was able to get the information I needed from Minuteman Press International and its franchisees. I wouldn’t call them unexpected challenges, but challenges they were. Minuteman Press gives you the tools you need. Two weeks of training before I step foot in my new business and dedicated support with my local regional vice president and local area manager in the shop for a week helps you manage the challenges and prepare for them as they come. Coming from a larger corporate environment, the challenge I found most formidable was the load to shoulder. Everything from hiring new employees, initially marketing the business, meeting OSHA standard, accounting methods, to simple aspects of running the business like making sure there was coffee, paper towels or even toilet paper. My regional Minuteman Press support team was there for me like champs though. Between my VP Dan Byers and my area manager Jack Panzer, they helped me through it all. That includes hiring new employees, setting up my infrastructure and a gentle reminder that, "Hey Pete, you may want to pick up more hand-soap for the washroom on your way home tonight." By the time they left I had what I needed to run my business and was confident I could manage my time to get it done! Do your due diligence. Speak openly to the franchisor and existing franchisees. Spend time in a few locations of the franchise you’re researching. Get to understand what your average day is going to look like when you take over the business – in a perfect world nothing should be unexpected, you should know the challenges ahead and have the tools to overcome them. If something comes up you don’t understand – you should have someone to call for help. Make sure the franchisor can give you those tools. More of the same! We took an underperforming location and we’ve built it up to an award winning store. We’ve grown our annual volume to levels never before achieved in my area and we’re looking at double digit growth again for 2015. With the ever-changing marketplace and Minuteman Press’s commitment to see us into the future with success, I don’t see why we won’t have double digit growth again for 2016. I plan to grow my business to the point where I can say, “That’s enough let’s maintain this level." I haven’t hit that ceiling yet, but I know the folks at Minuteman Press will continue to help me get there.